A new study of dogs' genes shows that the dog's predecessor was separated from the wolf already sometime between 27 000 and 40 000 years ago. Analysis of the genome from a prehistoric wolf from the Taimyr Peninsula in Russia shows that it probably was the common ancestor of today's wolves and dogs. The genetic study is published in the scientific journal Current Biology. Two of those who have been involved in the study are the researchers Pontus Skoglund, at Stockholm University and Harvard University in the US and Love Dalén at the Swedish Museum of Natural History. “It seems that the dog was domesticated much earlier than previously thought. One possible scenario is that the domestication began at least 27,000 years ago, but that it took many thousands of years before intense selection by humans led to the development of typical dog-like morphology”, says Love Dalén. Love Dalén, one of the researchers behind the study, at the Swedish Museum of Natural History. “It may have been a long process when the wolf became dog. 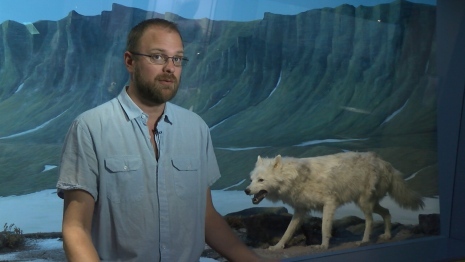 One theory is that the process was started by wild wolves who voluntarily started to be around people to, among other things, exploit that there was food in the vicinity where people lived”, says Pontus Skoglund, who is lead author of the study. The mapping of the prehistoric wolf genome was done from a small piece of bone that Love Dalén found at a research expedition to the Taimyr Peninsula in northern Siberia. Genetic tests showed it was a wolf bone. Initially, they didn’t realize the bone fragment came from a wolf at all; this was only determined using a genetic test back in the laboratory. But wolves are common on the Taimyr Peninsula and the bone could have easily belonged to a modern-day wolf. On a hunch, the researchers decided to radiocarbon date the bone anyway. It was only then that they realized what they had: a 35,000-year-old bone from an ancient Taimyr wolf. The genetic analyses also show that modern-day Siberian Huskies and Greenland sled dogs share an unusually large number of genes with the ancient Taimyr wolf. “The power of DNA can provide direct evidence that a Siberian Husky you see walking down the street shares ancestry with a wolf that roamed Northern Siberia 35,000 years ago,” says Pontus Skoglund. Read article in Current Biology.